OH REJOICE WITH ME! I just got the best Mother's Day gift a 'Jajjah' could receive. God is so great and He is so good to do what He’s done for my spiritual son’s spiritual son!!! 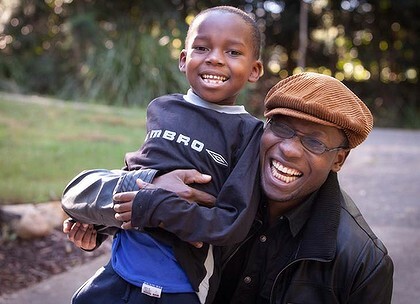 Peter Sewakiryanga was interviewed by the Sydney Morning Herald about this medical situation concerning 5 year old George (See link below). I was blessed beyond measure and full of joy when I saw this picture from the newspaper! There are no words to describe my gratitude for all of you who TOOK ACTION to help George! THANK YOU! THANK YOU! Glory to God for the doors only He could open for this child’s surgery and recovery! It is your gifts and prayers that made the difference and no doubt there will be a special jewel in your crown with his name on it! Thank you for your prayers and thoughtful consideration to financially support the ministry of the Father’s love to the nations. Here is a link to the article that ran in the newspaper. It shares more details about what has been going on with George.